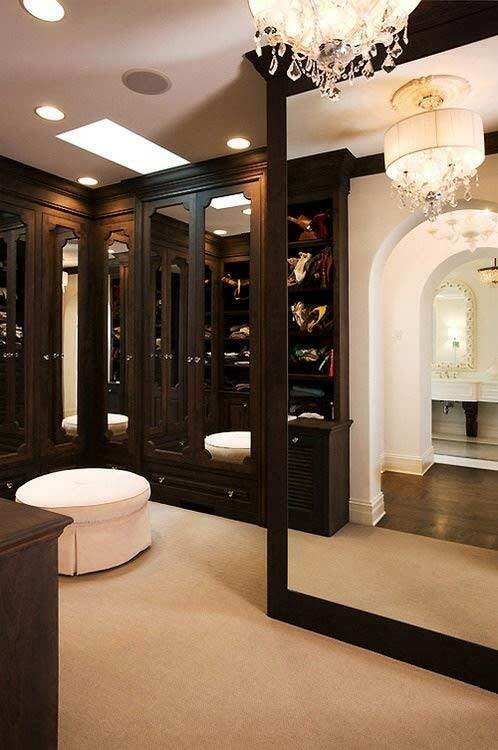 Almost every woman, who cares about her beauty, dreams of a modern dressing table in her bedroom. The natural desire to be attractive and compelling, forcing her to buy mass cosmetics and perfume products. Where to store all these bottles of creams, boxes of powder and rouge, lotions, perfume water, as well as brushes, combs, curling irons, hair clips, jewelry, and so on? All this can be compactly placed in the dressing table drawers. Before you buy a modern dressing table, consider the place in the apartment where you will put it, and measure the area of the selected centimeter of space to clearly know the dimensions of the future purchase. 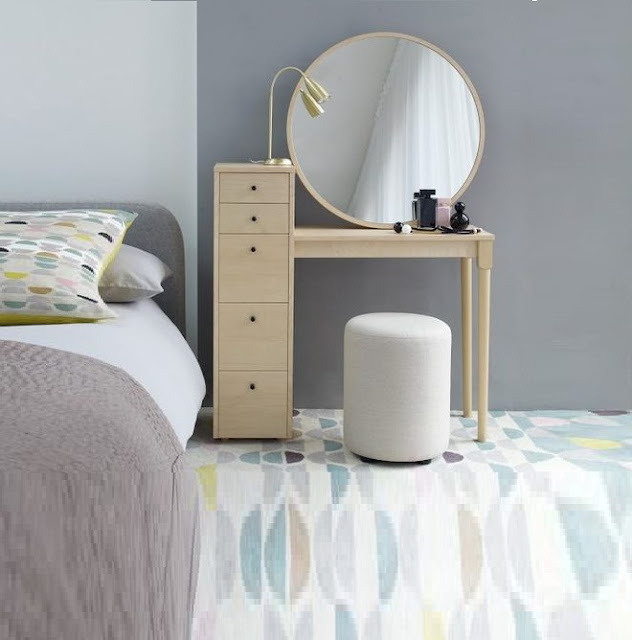 The most modern dressing table designs are made for the bedroom. the modern dressing table design should perfectly fit into the style of your bedroom furniture set, did not look awkward or aloof. Pay attention to the lighting of the room. The place where you put the dressing table in the bedroom requires a lot of daylight. Try to put the dressing table on a mirror as close as possible to the window. There are a lot of dressing table designs for sale: on legs, with one or two tables, with one or a plurality of various drawers and shelves. But, besides the huge selection of different shapes and configurations of the modern dressing table designs, do not forget the comfort options. Under the small dressing table, you should have a lot of legroom. 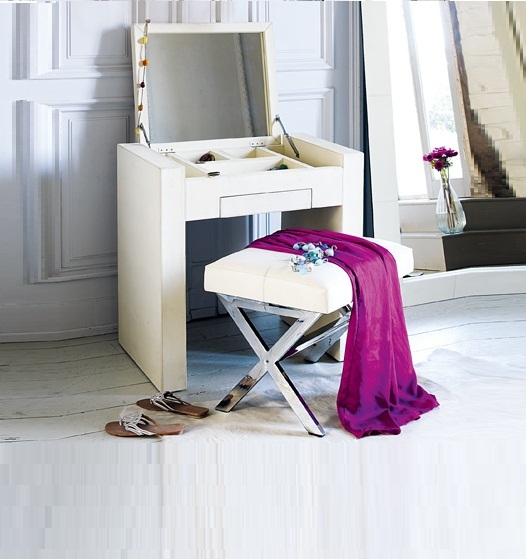 small dressing table chair or ottoman is better to choose immediately. If it is low and you have to sit up to reach for the dressing table mirror, so it is very uncomfortable. 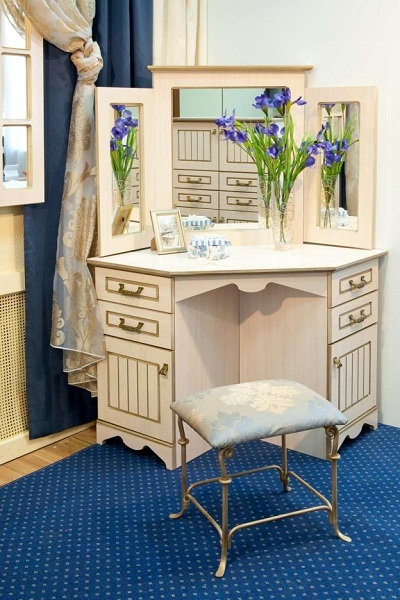 For a small space is better to pick a corner dressing table. 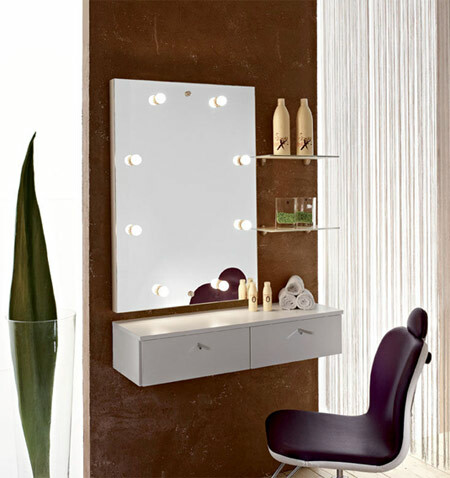 The small dressing table mirror creates the illusion of expansion and visually increase the room. To save space there is small wall mounted dressing table designs, which are mounted on the wall as a shelf. Dressing table mirrors - a very important detail in the small dressing tables and the modern dressing table designs in general. Usually, it is attached to the small dressing table top, it can be a simple single or triple (trellis). 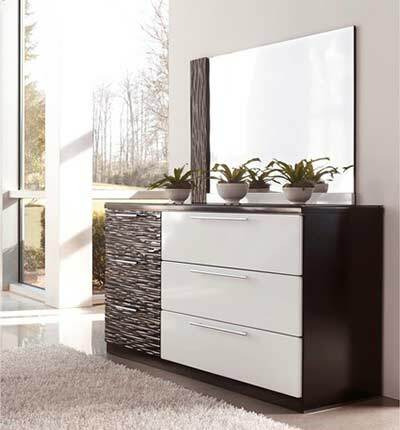 Triple dressing table mirror with movable side doors allow you to see your hair in different angles. The two-way rotary mirror is also convenient, of which one side will increase your face, which is very important when doing makeup. 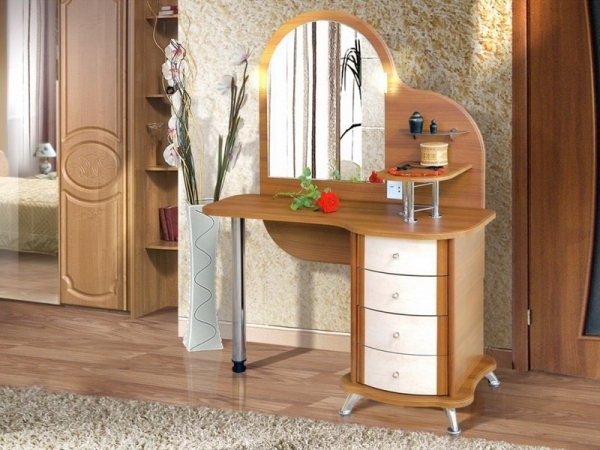 Another option: dressing table with mirror can be removable and hung directly on the wall or hiding in the folding table top, which is called small dressing table with folding mirror. In the latter case, a modern dressing table can serve as a desk. It's a good option for the living room, office or hallway. The interior furniture directly depends on the material, fittings and design solutions. The choice is quite wide: from the classical model of natural wood to modern plastic and glass. small white dressing table with mirror lights looks fashionable and original. Built-in spotlights give uniform illumination and decorate the small dressing table and the roomy bedrooms. 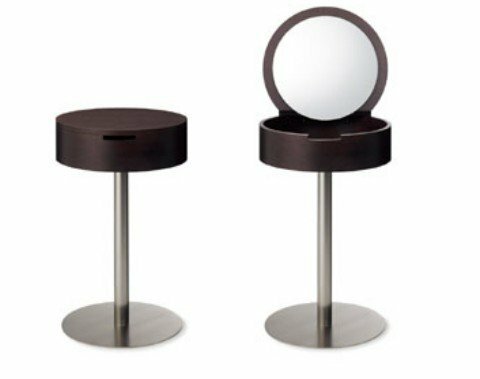 The makeup dressing table care may be quite problematic in the sense that cosmetics is composed of dyes that can leave stubborn stains on the table top. This is especially true of lacquers, enamels for nails and tools of removing the varnish. so you should take care of this problems and ask for a suitable cleaner for the tools you always use. 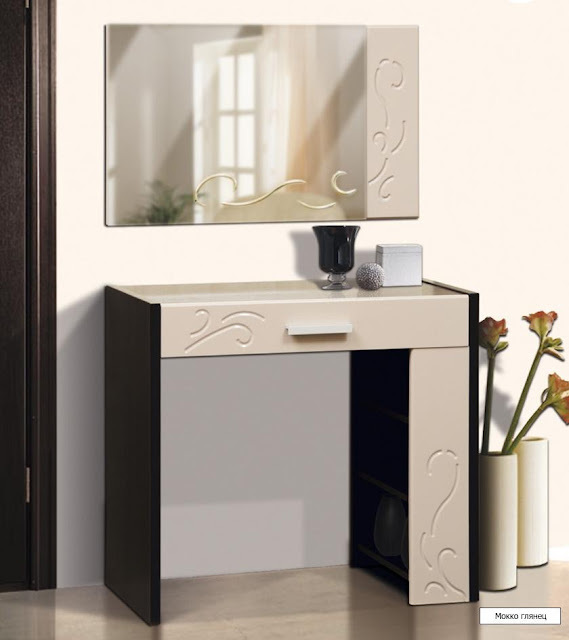 small modern dressing table for woman - this is not just an organizer for cosmetics. This is a purely woman personal territory, her favorite place in the house. With proper choice of such an acquisition would give her a lot of positive emotions.